Garson, G. D. (2012). Parametric Survival Analysis. Asheboro, NC: Statistical Associates Publishers. Survival analysis is the study of time-to-event data. Its terminology traces back to medical studies where the event of interest was death, and to industrial studies where the event of interest was failure, such as burn-out of a motor or bulb. The objective in these seminal studies was to understand the correlates of survival, hence survival analysis. Survival analysis may be parametric or semi-parametric. 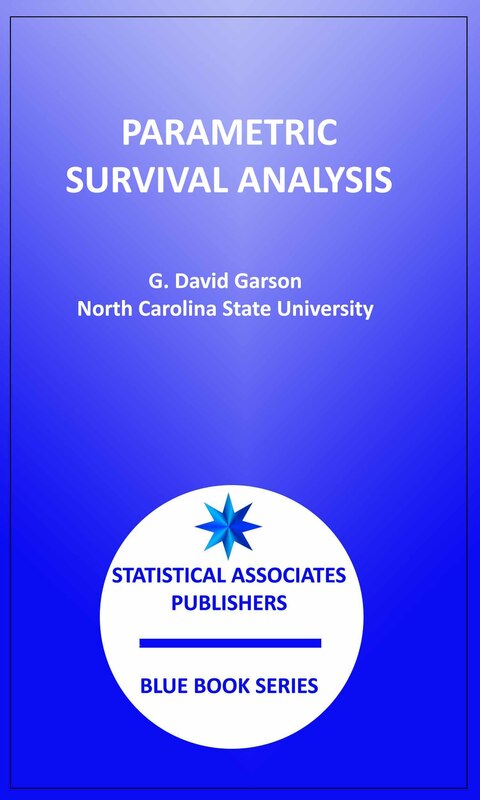 This volume of the Statistical Associates "Blue Book" series treats parametric survival analysis. "Parametric" means that an essential parameter, the baseline hazard function, must be specified by the researcher in advance. The baseline hazard function defines the chance of experiencing the event of interest (the "hazard", which traditionally was death or failure) when other predictors in the model are held constant. Positing the correct baseline hazard function is quite challenging, often leading the researcher to rely on semi-parametric survival analysis, which does not require this. Cox regression is the prime example of semi-parametric survival analysis and is treated in a separate volume. A related term is "event history analysis," which is also called duration analysis, hazard model analysis, failure-time analysis, or transition analysis. Event history analysis is an umbrella term for procedures for analyzing duration-to-event data, where events are discrete occurrences. "Event history" studies have been common in the study of international relations, where events may be wars or civil conflicts. Many of the earlier conflict studies utilized Weibull and other parametric survival analysis models and therefore event history analysis is often seen as a type of parametric survival analysis. Coleman (1981: 1) defined event history analysis in terms of three attributes: (1) data units (ex., individuals or organizations) move along a finite series of states; (2) at any time point, changes (events) may occur, not just at certain time points; and (3) factors influencing events are of two types, time-constant and time-dependent. Event history models focus on the hazard function, which reflects the instantaneous probability that the event of interest will occur at a given time, given that the unit of analysis has not experienced the event up to that time. While duration until death or failure were the classic examples, duration of peace until the outbreak of war was an example in international relations. In the last few decades, survival analysis has been applied to a wide range of events, including "hazards" which a positive meaning, such as duration until the event of adoption of an innovation in diffusion research. Other applications include study of longevity of trade agreements, strike durations, marriage durations, employment durations, and innumerable other subjects.